I have a notebook -- a paper one -- that I don't update often, but it has business/product ideas that go back six years. I just found a post by Steven Johnson on what he calls the spark file, a simple chronology of ideas and hunches that can later grow into something more. The key is to capture as many hunches as possible, and to spend as little time as possible organizing or filtering or prioritizing them. (Keeping a single, chronological file is central to the process, because it forces you to scroll through the whole list each time you want to add something new.) Just get it all down as it comes to you, and make regular visits back to re-acquaint yourself with all your past explorations. 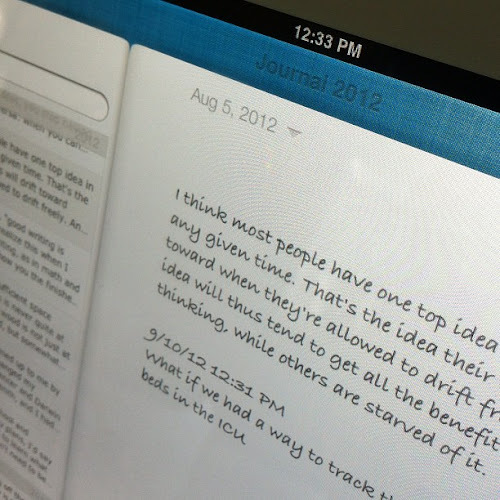 If you have Chronicle 2, try it with one of your notebooks and you'll always have it with you.